When you’re in the adaptation screen it tells you all the prerequisites and each step has its own explaination. You said you did it before, why are you confused this time? Just wondering not trying to give you a hard time. I screwed up. I would do it and then drive the car getting it up to temp when it was not up to temp to start with. It is so cold here..25 degrees and I do everything in the garage , than go for a ride. My screw up! Thanks for the insight though. where do you purchase this software? thanks! I have complete systems if you're interested, PM me. I installed Code 890 (Pneumatic Rear Door) into my W211 Station wagon. Now I cant find the N121 (control unit for peumatic) with Xentry. I have to add it with Xentry into the my System but how and where? The N111 knows the new option and the cluster too but its show nothing into the cluster wen I will use the garage door opening level for the rear hatch. It seem that the units dont know that they have that featcher now. If I look with Xentry into the SAM fond, the N121 dont show up. the Can-wires high/low are all connetet into SAM fond from N121. My MB STAR C4 gives me a 2173-11 fault in Xentry. Does anyone know what that is and how to fix it? That ain’t help him. It’s the old SD system on XP basis and that error is not covered on any forums. The settings are not there if you look closely. I told you it’s not a simple fix. Sorry. Any luck with activating this feature on a non TPMS equipped vehicle? Can anyone confirm there's a tire pressure warning you can activate with STAR on non-TPMS equipped cars? "Tire Pressure Loss Warner can be activated through stardiagnose on any 2006 W211...no parts needed, it gets it's reading off ESP - just some version coding - no reading of airpressure in the IC, just a warning when the pressure of one of the tires drops too much. Tire Pressure Monitor System is the more active system that has its own control module, 4 antennas, 4 senders and pressure readings in the instrument cluster...this can be retrofitted in any W211 and costs approx 2000USD to do so"
Last edited by wanderlust360; 03-12-2019 at 01:34 PM. Just ran into an odd issue. When trying to establish communication with STAR it will say at some pont -- No cumunication with multiplexer circut 30 voltage fault -- All circuts good and I can link with a scanner , data looger and OBD gauge. I sort of remember this years back but don't remember what I did. Any ideas?? Bad Chinese mux or cable or setting. Hard to tell. Could be anything. I am not sure what this unit is. I can pull some numbers off it but it is probably a Chinese unit, I will look tonight.. It was working perfect the night before and all I did was go on the simulator to look around....who knows what happened. That’s not what I meant. Is it a PartD or SDconnect? Yes, it can be activated. It is mandated on US vehicles around that model year, so if it is a US vehicle not equipped with the Mid/High-Line TPMS, it should have this activated automatically. If not, you will need to code it manually. You are running Windows 10 x86 and the paths above were taken from a Star Diagnosis machine based on the Windows XP platform, so they would not be valid on your OpenShell installation. My car, in Japan, has a back up warning "feature" where it chimes incessantly as long as the transmission is in reverse. Does anyone know where I could disable this "feature" using Xentry? Also, I had a cable harness installed behind the COMAND that enabled me to close all the windows, sunroof and the lift back, I have a station wagon, with one push of a close button on the key fob (didn't need to hold the button until everything closed). I had to remove the cable harness so I'd like to enable this function via Xentry. Could anyone offer some advice? Last edited by dacia; 03-25-2019 at 10:21 PM. The chime cannot be disabled. I have done the following for customers: remove the cables from the buzzer, measure internal resistance, look up a resistor with equal resistance and solder it on the harness to avoid faults to be stored. The second question I didn’t understand what you want but why a switch? Flash your car with the proper firmware and you can open and close the rear gate with your key FOB. I though that chime only sounded in Japanese spec cars, not in the US. When I had the cable harness installed I could just press the close button once and walk away from the car, everything closed automatically, windows, sunroof and lift gate, if it was open (I have a power lift gate). Of course the car doors also locked. The same in reverse as well, I pressed the open button twice and all the windows and sunroof fully opened, not the lift gate of course. Normally we have to keep pressing the close button to close everything or the open button to open everything. How about disabling the ECO On/Off button? That's possible with Xentry, correct? 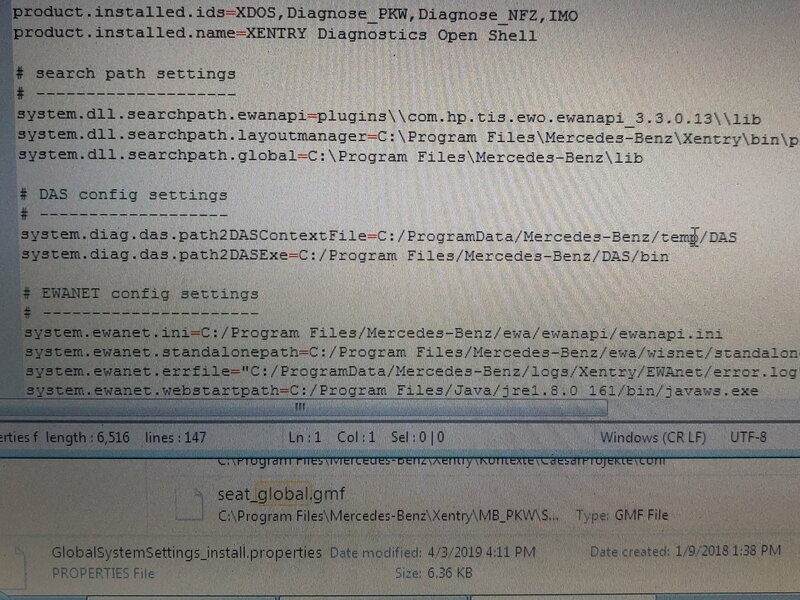 If I flash the firmware do I need SCN coding? Last edited by dacia; 03-25-2019 at 10:47 PM. No SCN needed or that. Just the right flash files and knowing what settings need to be changed. I did the buzzer mod on a German station wagon last year in Germany. Thanks. I guess I will have to live with the buzzer. I will try to find the flash files for Vediamo. Hey guys, maybe this will be helpful to some other folks as well. While playing around in the ME developer mode options (normally in german), I downloaded all my settings, and to my surprise all the dev mode variant code options showed up in english. So I PDFed the page and now I've got this little gem. Made it very easy to navigate the german dev mode nonsense for the ECU at least. I am considering buying a STAR diag system. I have a Dell D630 (M2300) laying around. What are my best options? This will be used primarily on a 2009 E63. Specifically, I am going to replace headlights (transfer buffered data), want to program NTG2.5 to enable backup camera, maintain AIRMATIC, and perhaps, other mods. I think I will need the Developer mode. Any guidance is appreciated.